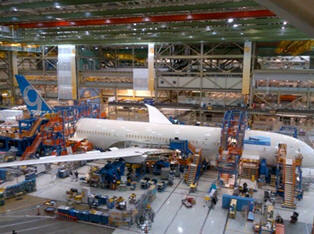 June 3, 2013 - Boeing has begun final assembly of the first 787-9 Dreamliner. The newest member of the 787 family began taking shape on schedule May 30 in Everett, Wash., when Boeing started joining large sections of the super-efficient jet. Boeing's global partners delivered the first 787-9 sections to final assembly on or ahead of schedule, and strong progress continues beyond, with major assembly under way on the other flight-test airplanes. "The dedication, quality and skill of our partners are helping drive our disciplined performance," said Jenks. Boeing will build the first three 787-9s on its Temporary Surge Line in Everett to allow for smoother integration of the 787-9 into the production system while continuing to ramp up production across the 787 program. The 787-9 will complement and extend the 787 family, offering airlines the ability to grow routes opened with the 787-8. With the fuselage stretched by 20 feet (6 meters), the 787-9 will carry 40 more passengers an additional 300 nautical miles (555 kilometers) while using 20 percent less fuel than similarly sized airplanes. The 787-9 leverages the visionary design of the 787-8, offering the features passengers prefer such as large, dimmable windows, large stow bins, modern LED lighting, higher humidity, a lower cabin altitude, cleaner air and a smoother ride. The vertical stabilizer on this 787-9 reflects the new Boeing Commercial Airplanes livery, a refreshed look for the Boeing family of airplanes that started with the 747-8 and evolved with the 737 MAX. Many features of the livery on the original 787 are reflected in the new design. The prominent number designator on the tail helps distinguish various models within the same product family. First flight of the 787-9 is scheduled for the second half of 2013, with first delivery to launch customer Air New Zealand set for early 2014. 20 customers around the world have ordered 355 787-9s, accounting for 40 percent of all 787 orders.